Sour Cream Corn Bread paired perfectly with the Chili I made for dinner the other night. The sour cream in the recipe makes it very moist. Crumbly, dry cornbread needs a stick of butter melted on it just to be able to get it down. 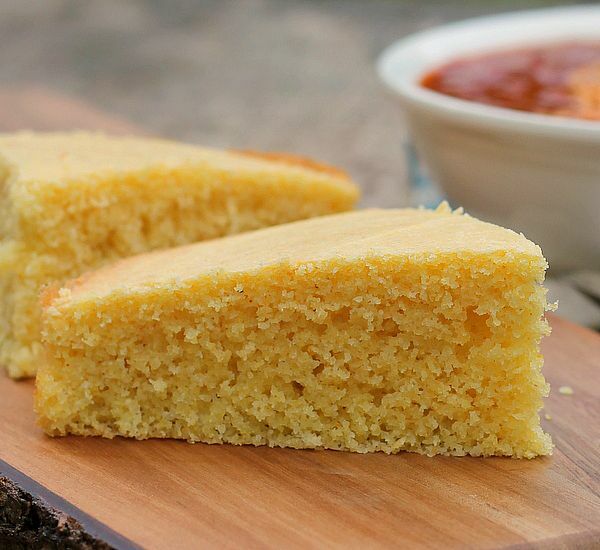 Not so with this corn bread recipe, it was light and moist. I love that, the only thing I like dry is my laundry when it’s hanging on the line. I loved the cornbread so much I’d like to make it for breakfast, I think it would go extremely well warm from the oven with bacon and eggs. I don’t think there’s a limit to what you could pair this with, it’s just that good. Enjoy! In a medium bowl combine the flour,cornmeal, baking powder, baking soda and salt. Stir to combine, set aside. In a large bowl combine the butter and sugar, beat until creamy. Add one egg at a time, beating well after each addition. STIR in the sour cream and milk. Add the dry ingredients to the bowl, beat until just incorporated. Pour batter into the prepared pan, bake 25 minutes or until golden brown. I would love for you to share at this weeks Happiness Is Homemade Party! http://wp.me/p466oG-2FQ Have a terrific week! This looks delicious. Perfect to go with some warm Fall dishes. Thank you for linking up at #HomeMattersParty and we hope to see you again soon!